Situated across San Diego Bay from downtown San Diego, Coronado boasts a unique combination of quaint small-town friendliness and sophisticated luxury. Defined by two famous structures, the historic Hotel del Coronado and distinctive San Diego-Coronado Bridge, the "Crown City" offers an enchanting island experience that has made Coronado one of California's most sought-after vacation destinations for more than 100 years. The city is famous for pairing a relaxed atmosphere with pristine beaches, first-class accommodations, exciting arts and culture and abundant outdoor recreational activities.Following are some of the offerings that make Coronado a perfect year-round destination for a romantic weekend getaway, fun-filled family vacation or relaxing day at the beach. 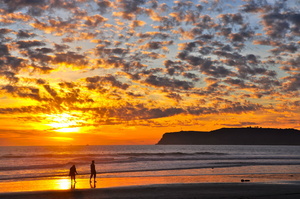 Coronado Beach at SunseKnown for picturesque coastline views and expansive stretches of white sand, Coronado has several distinct beach experiences to offer visitors. Occupying the area between the iconic Hotel del Coronado and Naval Air Station North Island, Coronado Beach is a 1.5-mile long aquatic wonderland for swimmers, surfers, sunbathers and America's military elite. Popular for its wide, sandy beaches and set against a backdrop of beautiful homes, Coronado Beach is consistently named among the Travel Channel's "Best Beaches in California" and annually ranks among Dr. Beach's "Top 10 Beaches in the US," taking the #1 spot in 2012 (www.drbeach.org). Families arrive early in the morning toting umbrellas, beach towels and picnic coolers for an all-day stay. Visitors often fly kites at the southern end of the beach, join pick-up volleyball games on the sand courts behind the main lifeguard station and enjoy romantic strolls along the sand at sunset. Just north of Coronado Beach, North Beach is a favorite site for surfers in the morning and bonfires in the evenings. The northern most section is known as Dog Beach, because four-legged visitors are permitted off leash. In June 2010, Fido Friendly magazine named Coronado's Dog Beach one of their "10 Sizzling Summertime Fido Friendly Beaches." On a typical day, dozens of dogs can be seen rolling in the sand, splashing in the waves and fetching Frisbees. Nestled between the Pacific Ocean and San Diego Bay along the isthmus that connects Coronado southward to Imperial Beach, Silver Strand State Beach is a popular spot for swimming, biking and RV camping. The name references the tiny, iridescent seashells that sparkle along the shoreline. 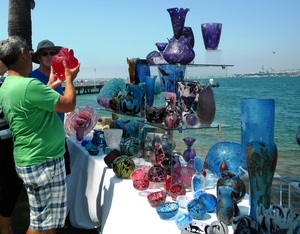 Coronado's rich history, eclectic art offerings and engaging cultural diversions are on display in galleries, theaters and community events year-round. Coronado is one of San Diego's most desirable shopping districts known for sophisticated, upscale, designer apparel boutiques, art galleries, jewelry shops and more. Coronado offers a mouthwatering array of dining options. Whether the mood calls for a romantic candlelit dinner or a casual post-beach bite, visitors are guaranteed meals as memorable as the "Crown City" itself. Ideally situated between the Pacific Ocean and San Diego Bay, Coronado offers some serious dining with a view. Mistral at Loews Coronado Bay Resort offers spectacular floor-to-ceiling views of San Diego Bay and the striking San Diego-Coronado Bridge, www.dineatmistral.com. Equally impressive are the panoramic bayside views from Current at the Coronado Island Marriott Resort, www.coronadoresortmarriott.com. Romance is always in the air at 1500 Ocean, the Hotel del Coronado's signature restaurant, www.1500ocean.com, and the intimate Chez Loma French Bistro, located in a charming historic house just off Orange Avenue, www.chezloma.com. For more casual eats, the Coronado Brewing Company serves up great burgers, classic brewpub fare plus award-winning craft beers, www.coronadobrewingcompany.com. Danny's Palm Bar & Grill serves up a "dive bar" burger considered by many to the best in the region. Making waves on the seafood menu are Peohe's, specializing in fresh tropical seafood and Pacific rim cuisine, www.peohes.com; The Brigantine, a Coronado tradition, www.brigantine.com, and the Del's Sheerwater overlooking the Pacific Ocean, www.hoteldel.com/Sheerwater-dining.aspx. South of the border flavors can be found at Miguels Cocina, known for their award-wining Mexican food, www.brigantine.com/locations_migcor.html; Candelas on the Bay, offering upscale Mexico City-style cuisine, www.candelas-coronado.com, and Costa Azul, a perennial favorite for classic Mexican fare, www.costaazulcoronado.com. To satisfy one's sweet tooth, Tartine, a French bakery and bistro, is the perfect place for a light meal and sweet treat, www.tartinecorondo.com. Mootime Creamery is another sweet sensation for frozen yogurt and homemade ice cream, www.mootime.com. Outdoor enthusiasts can enjoy a wide range of activities in Coronado, from surfing on the Pacific Ocean to biking along scenic San Diego Bay to enchanting waterfront golfing. For visitors who feel the call of the sea, Coronado boasts two full-service marinas, the Glorietta Bay Marina and Loews' Crown Isle Marina, located on San Diego Bay across from the Silver Strand State Beach. Both offer rentals ranging from paddleboats and sailboats to jet skis and deep sea fishing. For those who want to hang-ten, options abound in the Crown City. Coronado City Beach faces due south with gentle swells that make it perfect for the novice to intermediate surfer. Silver Strand State Beach also offers a gently sloping break and fun and forgiving surf for beginning surfers. Beginners can take lessons with expert instructors at the Coronado Surfing Academy, www.coronadosurfing.com, or the Executive Surfing Club www.executivesurfingclub.com. 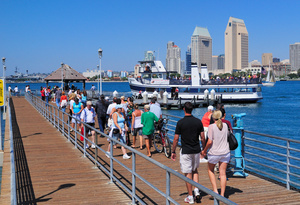 Coronado Ferry Landing photo by Brett Shoaf Part of the charm of visiting Coronado is the journey. Options include driving across the beautiful San Diego-Coronado Bridge, taking a ferry or water taxi across San Diego Bay and driving along the seven-mile long Silver Strand peninsula. The breathtaking San Diego-Coronado Bridge became an area landmark the moment it opened in August 1969 during San Diego's bicentennial. Then-California governor Ronald Reagan became the first person to drive across the span. The distinctive curve and soaring sweep of the bridge made Coronado widely accessible by vehicle traffic for the first time in the city's history. Over two miles long and five lanes wide, the bridge has a clearance of approximately 200 feet that allows massive merchant and military ships to pass easily beneath it. 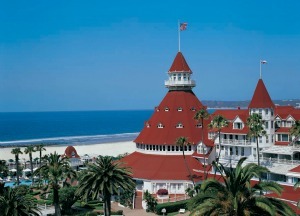 For more information on Coronado or the entire San Diego region, visit the San Diego Convention & Visitors Bureau's website, www.sandiego.org/coronado, or call (619) 236-1212. TravMedia sources contributed to this article. Links to the websites of Lodging, Dining and Craft Beer Purveyors can be found in Taste California Travel's Resource Directory. Also available at that directory are links to all the wineries in the nearby Temecula area. Suitecase Psychology: What Does Your Luggage Say About You? The next time you head to the airport you might want to think twice before shoving your swimsuit and sunscreen into a hold-all that's seen better days. Research released today by leading airline Virgin Atlantic reveals that the luggage we carry says a lot about the type of traveler we are, and we find out which celebrity suitcases are most like our passengers'. The study shows that one in five of us (20%) can't remember the last time we bought new luggage, while more than half (55%) would only upgrade their suitcase if it was worn-out or broken. That said, the lifestyles of the rich and famous are quite likely to influence us at the wheelie shop; 25% of 16-24 year olds admit they'd buy a bag based on what their favorite celeb's been seen toting at check-in. Paul Bushell, Vice President of Airport Operations for North America at Virgin Atlantic, commented: "Virgin Atlantic carries over six million bags a year to London and beyond, and we've seen a lot of changes since our first flight in 1984. The standard black case with a colourful pom-pom has taken the backseat as more and more of our passengers choose to show off their personality and make a fashion statement with their bags. Our crew carries almost anything, from leather holdalls to leopard print cases, and too many designer trunks to mention. And following the focus on athletes in London we're seeing more and more travelers taking along their sporting equipment, which Virgin Atlantic carries for free." So what exactly does your luggage say about you? And which high profile jet-setter's style do you channel? The Designer Trunk: This luggage is beloved by those who enjoy showing off a bit; their Upper Class style is reflected from limousine to the lounge, and everywhere there's flashbulbs to be found. If you won't leave home without your beloved collection of LV luggage, double-check the name tag upon arrival to make sure you aren't picking up Paris Hilton's, Karl Lagerfeld's or Victoria Beckham's. The Corporate Case: This traveler has been there, packed that, and is as used to breezing in and out of hotel lobbies as a concierge. They like to opt for something practical, low-key and convenient for all those airport runs. They tend to be rather focused and determined, too, meaning a time-managed flight that includes working on the laptop or catching up on some well-earned power-napping rather than putting on the headphones and chilling in front of a movie. One of our favorite celebs who cops a corporate case is the beautiful Miranda Kerr. Crazy Colored Luggage: Either attention-seeking, or just keen to instantly recognize their personality piece as it makes its way around the carousel, this type of traveler is zany and fun. You never know what to expect when you share a vacation with this character, or what they've packed (though you can count on a sombrero and fluorescent bikini regardless of the destination). The Hold-All: This is the Indiana Jones of travelers, the one who manages to pack everything they need into one piece of hand luggage, finding space for things the rest of us forget like adaptor plugs and chargers, and yet they still have room for a different pair of flips and cover-alls for every day of their break. Frighteningly practical and fabulously confident, this optimist will tend to be the most seasoned traveler of the lot because for them it's all about low-drama planning rather than last-minute panics. One-bag wonders include worldly mom Angelina Jolie, our favorite royal rascal Prince Harry, and 007 Daniel Craig. The Backpack: Meet the eternally young at heart traveler, who enjoys a freewheeling, commitment-free lifestyle. They hate being pinned down and treasure the ability to go anywhere the wind takes them. This frequent flier is a true explorer, a stout-hearted adventurer who will make the best of any situation. Generally a packing option for teens and college students (who roll with an entourage), Justin Bieber's famously flown with little more than what's required for most folks' morning regimine. Multiple Suitcases: This 'real housewife' refuses to leave home without every pair of shoes she owns (hey, you never know where you'll end up when you travel!). With little regard for excess baggage fees and maximum need for personal creature comforts, this sort of packer might one day end up on an episode of 'Hoarders,' but at least she'll look good on air! Along with the entire cast of 'The Real Housewives of New Jersey' other reality 'stars' such as Snooki have been famously snapped at arrivals, totally dwarfed by their duds. TravMedia.com sources contributed to this article. Editor's Note: Planning a trip? You can find thousands of Lodging and Dining options all over California in the easy-to-use Resource Directory of Taste California Travel. Life is certainly sweet for one Madera Wine Trail winery known for their sweet dessert wines and their vermouth. Quady Winery earned several accolades recently for their Vya Vermouth and several of their wines. Vya Vermouth impressed the people at Made in America so much that Quady Winery was nominated for and received an American Treasures Award. 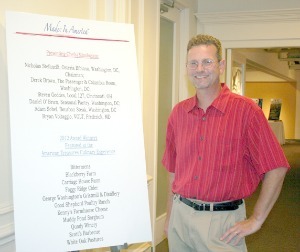 Since its inception in 2008, Made in America has recognized, promoted, and provided assistance to Darin Peterson, assistant winemaker at Quady Winery, accepts the American Treasure award at Washington DC reception. American businesses committed to production in the United States. Key to this effort has been providing companies access to resources and expertise outside those traditionally available within their industries. The American Treasures Awards are presented annually at the American Treasures Cullinary Experience to individuals and small producers in recognition of a singular and significant contribution to our Nation that both preserves and fosters a unique All American craft and tradition. This year’s awards are presented to organic growers and craft producers. The winners were carefully selected and vetted through a deliberative process by a National Advisory Committee consisting of individuals with relevant subject matter expertise. A special Congressional Honorary Steering Committee supports the initiative. “We’re very proud to be recognized nationally as a unique all-American craft producer,” said Andrew Quady. Andrew credited the ideal conditions of Madera and his staff with the creation of a product deemed an American Treasure. “We are proud to be designated an American Treasure along with a small selection of craft and organic food producers across the U.S.,” he said. Andrew said the unique history of the spirit, along with the experiential nature he strives for with the creation, captivated the Made in America judges. According to Made In America, The American Treasures Awards are presented annually in July at the American Treasures Cullinary Experience to individuals and small producers in recognition of a singular and significant contribution to our Nation that both preserves and fosters a unique All-American craft and tradition. This year’s awards were presented to organic growers and craft producers. The winners were carefully selected and vetted through a deliberative process by a National Advisory Committee consisting of individuals with relevant subject matter expertise. A special Congressional Honorary Steering Committee supports the initiative. Not to be out done, three of Quady’s wines received medals at the Lone Star International Wine Competition. Quady’s 2010 Elysium won Best of Show/Grand Star and a Double Gold. The 2011 Red Electra took silver and the Flore de Moscato earned a bronze medal. “It’s almost a double reward,” said Quady winemaker Michael Blaylock. “Everybody here strives to make sure it’s the best quality we can achieve in a given year and we feel great about giving it our all. Then when we are recognized elsewhere and we see the quality on the shelf, we feel a sense of pride. All of this is made right here in our hometown, Madera California, and for me, the main thing is I’m still having fun,” he said. To learn more about Vya Vermouth, visit www.vya.com. For more on Quady’s wines, visit www.QuadyWinery.com. Editor's note: Readers interested in learning more about Quady and other Madera County wineries can find links to their websites in the Central Valley section of Taste California Travel's Resource Directory. Also listed are links to hundreds of lodging and dining options in that part of California.